Book LD Lines Ferries tickets to and from the ports of Dover, Portsmouth, Gijon, St Nazaire, Dieppe, Newhaven and Le Havre online in advance at Ferryto.co.uk and you will always enjoy our cheapest available ferry ticket price. LD Lines are delighted to announce that LD Lines and DFDS Seaways joint initiative will launch a new Dover-Calais ferry service, starting 17 February this year, and can now offer an unrivalled choice of four ferry services across the English Channel. Whilst onboard LD Lines vessel you can enjoy a variety of bars and restaurants including the business lounge which is equipped with a full wireless internet facility or you can relax in your own private cabin or experience the new low cost reclining seats. The Norman Spirit is a modern superferry. Fitted with stabilizers, it provides optimal comfort whatever the sailing conditions. It can reach speeds of up to 21 knots and has a capacity of 1850 passengers, 250 cars and 75 lorries. On board you’ll find a range of venues to shop, eat and drink. There is ample comfortable seating and a refined but friendly atmosphere. Why not catch up on sleep in one of our comfortable cabins or try one of our luxurious Sleeper Seats? You’ll also find extensive outside decks, a children’s play area and a games arcade. With a real quality of service, the holiday begins from the moment you board the ship. "Bistro du Norman" Self-service Restaurant. All tastes are catered for in this relaxed and pleasant self-service restaurant. With excellent Meal Deals, we offer superb value for money whatever the time of day. A Children’s menu and vegetarian menu are also available. There is a range of comfortable cabins with something to suit all budgets and requirements. The Norman Spirit offers a range of 80 highly comfortable cabins (fresh bedding, sheets, blankets and air conditioning). En suite cabins with shower, sink and toilet. There are single-berth window cabins, four-berth window cabins and inside two-berth cabins. LD Lines restaurant is situated at the front of the ship and is the perfect location to enjoy a sunset dinner or watch the day arrive over breakfast. All tastes are catered for in this relaxed and pleasant self-service restaurant. With excellent Meal Deals, LD Lines offer superb value for money whatever the time of day. A children’s menu and vegetarian menu are also available. LD Lines has a great range of cabins with something to suit all budgets and requirements. All with comfortable beds and private bathrooms. There is a mixture of 4 berth inside and outside cabins to meet all travel needs. There is also a cabin available for passengers with disabilities. A cot is available upon request at the reception desk. Cruising on our ‘Motorway of the Seas’ Gijon – St.Nazaire route, the Norman Asturias has a capacity for 518 passengers, 120 freight vehicles and 195 cars. There are comfortable cabins for a restful night’s sleep and a superb range of facilities to enjoy. Onboard you’ll find a bar, restaurant, shop, cinema, WiFi and comfortable lounges. There is a great range of cabins with something to suit all budgets and requirements. All with comfortable beds and private bathroom. There is a mix of 4-berth inside and outside cabins and 2-berth outside cabins to meet all travel needs. There is also a cabin available for passengers with disabilities. A cot is available upon request at the reception desk. The Seven Sisters offers a choice of 50 cabins including one equipped with facilities for people with reduced mobility. All cabins have showers and toilets, so that you arrive at your destination feeling perfectly rested. All tastes are catered for in this relaxed and pleasant self-service restaurant. With excellent meal-deals, LD Lines offer superb value for money whatever the time of day. Children’s menu and vegetarian options are available. The LD Lines Norman Spirit also offers a children's play area, shopping facilities and an amusement arcade. LD Lines offer a wide range of cabin and seating options, including the fully reclining LD Sleeper Seats and cabins specially adapted for wheelchair users. 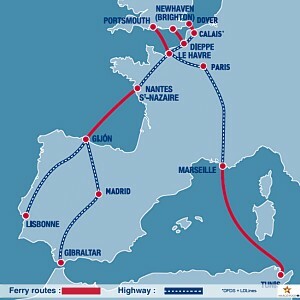 Ferry Logistics offer a personal and affordable LD Lines Ferries freight and cargo ferries reservation service to and from the ports of Dover, Portsmouth, Gijon, St Nazaire, Dieppe, Newhaven and Le Havre. Choose LD Lines Ferries ferries for the cheapest ferry ticket prices to and from the ports of Dover, Portsmouth, Gijon, St Nazaire, Dieppe, Newhaven and Le Havre.